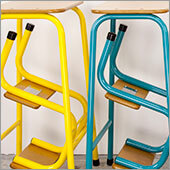 Proud to present the Hornsey, a beautiful retro step stool made in England. 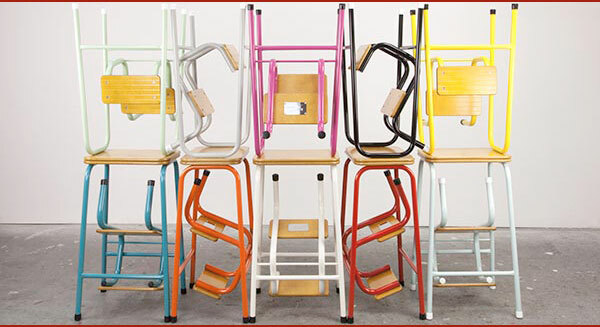 An old British favourite reworked in ten gorgeous colours for the 21st century. "Absolutely LOVE IT! It’s surprisingly dainty and just perfectly made. Perfect height for my table too. Love all the wood and especially your fab silver nameplate. So so pleased with it. THANK YOU!" 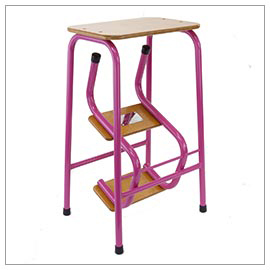 Hornsey stool in hot pink with black ferrules shown with steps folded in. 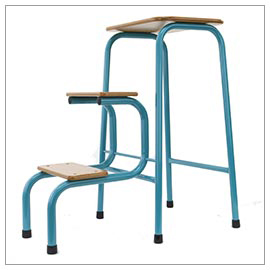 Hornsey stool in teal with black ferrules with the steps out. 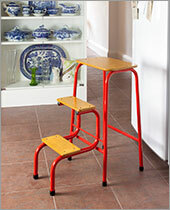 The Hornsey step stool is a practical addition to your home. 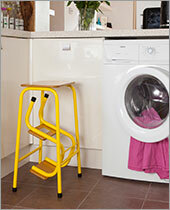 Our stool looks good even when folded and not being used. It brightens up a room and is always a talking point. 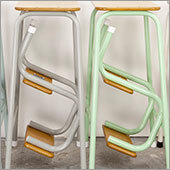 Choose from four retro pastel colours - cream, duck egg blue, mint green or pale grey. Only £195.00 including delivery. Choose from six colours - hot pink, teal, orange, yellow, red and black. Only £195.00 including delivery.